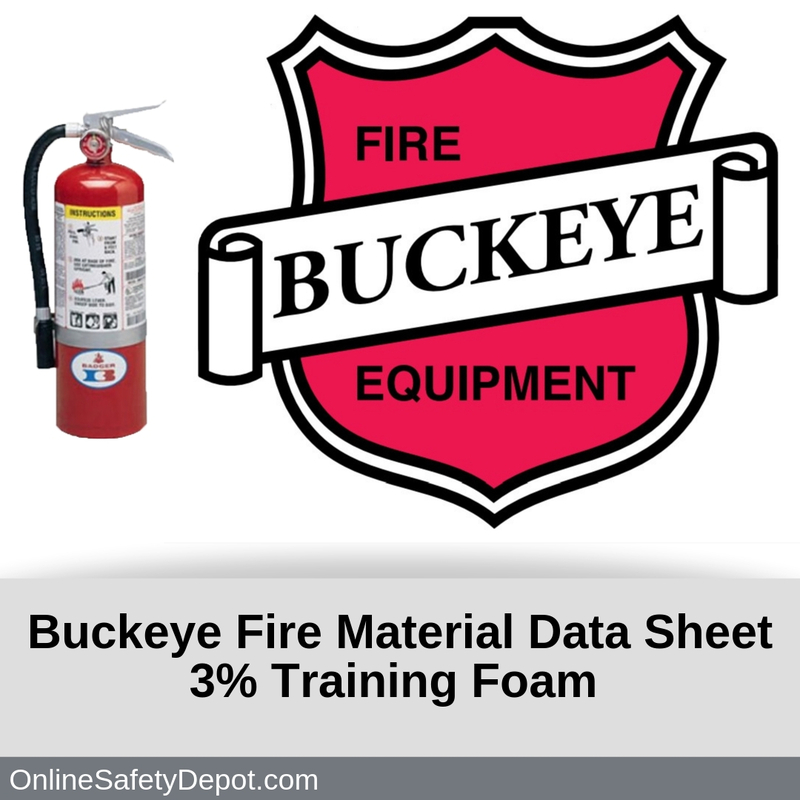 Buckeye Fire manufactures a 3% Training Foam. Buckeye’s MSDS for this extinguishing agent is included for download above and below. Here is a summary of the information included in the Buckeye MSDS PDF. This section simply lists what the product is called along with the contact information for Buckeye Fire. This section explains how to identify the 3% Training Foam and provides various hazard and precautionary statements pertaining to health, such as exposure to various body tissues. This section explains how to treat chemical exposure to the eyes and skin as well as how to treat someone who has inhaled or ingested the chemical. It also identifies existing medical conditions that may be aggravated by exposure to the 3% Training Foam. This section identifies the product as an extinguishing agent and if it is flammable and combustible. It also indicates if the agent may decompose in fire and release oxides of sulfur and nitrogen. It also indicates sensitivity to mechanical impact or static discharge. This section describes what to do in a situation where the 3% Training Foam has been released accidentally, including how to clean it up, and the process to decontaminate. This section instructs to avoid eye, respiratory, and skin exposure to the agent, the use of personal protective equipment when handling to limit exposure, and how the product should be stored related to its original container or extinguisher. This section explains the respiratory hazards of exhaust gases and incomplete combustion that exist during the use of the extinguisher and the recommended respiratory, eye, and skin protective measures to limit exposure. This section identifies the physical and chemical properties of the 3% Training Foam. This section lists the degree of stability, the incompatibles, and the byproducts of decomposition, and any known hazardous reactions. This section presents the known exposure effects from routes of entry through eye or skin contact, or inhalation and ingestion issues due to “chronic toxicity”, and any known “reproductive toxicity”. This section identifies any effects that agent has on ecosystem toxicity and aquatic life and its degradability. This section identifies agent disposal considerations and the potential differences that may exist between federal regulations and state or local regulations. This section identifies if the product is considered a hazardous material and how that can affect transportation of the agent in the US or Canada. This section identifies the ingredient’s international inventory status by country and agency, and the U.S. federal and state regulatory information of the agent. This section declares “other information” that may be pertinent related to the specific product including, but not limited to, HMIS Ratings regulatory information from other countries as well as any qualifying statements.